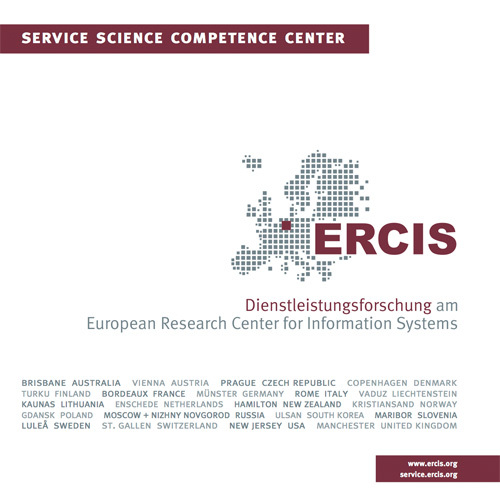 WI 2017 | ERCIS Competence Center "Service Science"
Information technology steadily permeates all areas of modern society. Simple objects become smart by embedding sensors and actuators. Social media allows private people, businesses and public administration for continuous digital networking. More and more data is gathered, enabling analysts to monitor current, analyse past and predict future events. In its sum, the digital transformation affects the behaviour of people, given structures, processes and information systems of an organization. On the one hand side, this transformation gives companies the opportunity for further growth, raised welfare and ecologically sustainable development. On the other hand, the digital transformation incorporates non-intended risks, which have to be pre-empted or faced. This conference track welcomes presentations, discussions and the development of innovative concepts for the digital transformation of individual persons, organizations, institutions, networks or society as a whole. We support a broad field of epistemic positions and research methods aiming for the development of novel theories and innovative IT artefacts. Especially, we welcome contributions aiming for “thought leadership”, whose results provide novel insights on effect mechanisms of the digital transformation and means of designing organizations and Information Systems (“from insight to impact”).